Since 2003, ‘medicinal’ cannabis has been available from Dutch pharmacies. But what does ‘medicinal’ actually mean? You could say that all cannabis is a medicine whenever it is used by a medical patient. After all, in that case the cannabis is used as a medicine, to treat a condition. However, the meaning of medicinal cannabis goes further than just that. The cannabis in Dutch pharmacies is of ‘medicinal’ quality, which means that it complies with pharmaceutical norms. Bedrocan BV produces the cannabis flos (dried flowers of the female plants, buds) by request of the Office of Medicinal Cannabis. 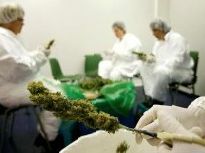 Cultivation of cannabis plants is done according to pharmaceutical norms for the production of botanical drugs, including the guidelines of (GAP). The dried flowertops are sterilized by gamma-irradiation at the facilities of , in order to eliminate any microbiological contamination. Both before and after sterilizing, the cannabis is analyzed in many different ways to ensure that it meets the quality standards that are described in the official guidelines (Monograph). This means, for example, that cannabis from Bedrocan always contains the same amount of active ingredients such as THC, CBD and terpenes. Subsequently, the product is packaged and distributed by a specialized international company, . The strict procedure for the production of medicinal cannabis guarantees a final product with a reproducible and reliable potency, composition, and quality. The Healthcare Inspector of the Ministry of Health supervises the entire production chain, and all production steps are performed by specialized companies. General appearance – flower buds must have certain size and appearance. No contamination with dust, hair, insects etc. Only when a batch passes all tests, it will be released for delivery to patients. More information about the specification for quality control testing can be found on the website of the .